1) The education secretary “politicises” education. This usually means amounts to the complaint that the politician in charge of education acts as if they are a politician in charge of education. “Politicisation” consists mainly of a) deciding on policies, b) arguing with people who disagree with those policies and c) attempting to implement those policies. It is often simply assumed that the opinions of a politician are worthless because they are “political” and the opinions of an educationalist, education journalist or education commentator are not. Michael Gove will always be identified as a Tory; David Blunkett as New Labour. But when a non-politician talks about education, whether they are an academic, journalist or activist, their politics are considered incidental to their views. This is even the case for those education commentators who have a history of involvement in politics and extremist politics. I for one would love it if next time Michael Rosen is on the radio arguing against teaching children to read he was described as “an associate of the SWP” or “a former candidate for Respect” rather than as “a children’s author”. Nobody is “apolitical” on education. The difference between politicians and others is not that they are political but they are open about it. When an education secretary is accused of making education political it simply means that they defend what they are doing in public. While what they are doing may not be right, it is much better if education decisions are discussed in public than if they are not. The worst ideas we, as teachers, are faced with are very often not those that are at the heart of public debate, but those like the introduction of A.P.P., the abolition of the National Literacy and National Numeracy Strategies or the creation of SEAL lessons which happened with minimal political discussion and largely below the threshold of public awareness. 2) The education secretary has never been a teacher. I am the first person to talk about the importance of listening to the frontline in education and how, it is often hard for people outside of the system to have any idea about what it is like. However, while I think that the perspective of teachers is so important, I have no confidence at all in the perspective of people who used to teach and then got a job in the education bureaucracy. LA consultants, teacher trainers, CPD deliverers or OFSTED inspectors do not noticeably have the respect of the teaching profession just because they used to be teachers; so why would an education secretary? It is entirely possible to have been a teacher and have no understanding of the system, as demonstrated by Estelle Morris, the one education secretary to have quit in disgrace due to realising she wasn’t up to the job. Ironically, the people who criticise education secretaries for showing leadership or direction often praise Estelle Morris, although admittedly they tend to go a bit quiet when asked to name anything she achieved in office. From their perspective doing nothing and quitting is the ideal performance from an education secretary. A further irony in this particular complaint is that, although I have frequently heard it used against David Blunkett, he did actually qualify as a teacher and teach in an FE college. 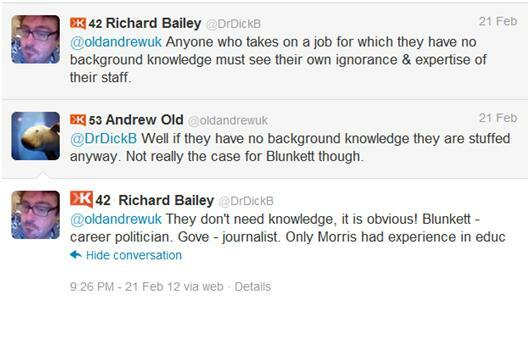 3) The Education Secretary is not an expert. Now, anybody in charge of a particular department, particular if they held it in opposition for a period of time, has a chance to read up on how that department and its associated instruments work. It is obviously better if somebody knows this stuff than if they don’t and I would be the first to criticise those education secretaries who didn’t seem to know their brief or have any idea what was going on in the education system. However, this complaint is not made simply if the education secretary gets something wrong, it is made when they dare say something that is in touch with the public. Too often “expertise” in education is not to know what is going on in education in practice, but to know what is going on in theory. To dare mention the Behaviour Crisis, or dumbing-down or anything else that we see every day in schools, is to provoke a wide variety of “expert” denialists. If you are a teacher and you mention it to the wrong audience then all of what you have seen is anecdotal. If a politician dares mention the truth it is “an agenda” and the Daily Mail will probably be suggested as a possible source. Even worse though, those who make this criticism tend to be confused between values and empirical facts. They will not recognise the difference between asking what works and asking what is worthwhile. They will suggest that academics are equally equipped to answer the latter as the former and seek to suggest that neither the public nor their elected representatives have any right to a say in what the public money invested in education is meant to achieve. Now, none of this is meant to be an apologia for Gove or Blunkett. As politicians showing leadership there is much to criticise them for. By all means criticise Gove for what is happening to our pay and conditions, our pensions and for some of the truly terrible people who are now, or likely to be, running free schools and academies. Criticise Blunkett for centralisation, tuition fees or his involvement in the thinking skills initiative. But don’t criticise any education secretary for doing their job and simply not being a mindless bureaucrat quietly imposing the ideas of the bureaucracy. Some concepts, like knowledge, are very useful in education. Others, like self-esteem, are invariably harmful and used to justify failure to educate. However, there is another category of concepts. There are also ideas that frustrate debate through sheer ambiguity; that allow arguments to rest on equivocation. These are the Weasel Words. The word is used because it is ambiguous; it can mean different things. Often we say you are engaged by something if it is fun or pleasurable, or if you are entertained or motivated. Those who argue for dumbing-down, for taking the hard work, the element of challenge and the mental stress out of the classroom will suggest “engaging” activities. If something is pointless fun, or a welcome break from hard work and all the unpleasantness of actually learning, then all the laziest students are likely to be engaged. Give them cakes; put on a video; tell them a funny story; make an arse of yourself and you’ll have engaged them. It’s not an achievement to engage because in this context it’s just another word for “entertain”, perhaps even “mildly entertain”, and it’s no big deal because, of course, anything can engage the mind of anyone to some extent and the tiniest things will entertain the tiniest minds. Teachers feel quite happy to admit that their job is not to entertain. Not everything can be fun, easy or popular with Year 10 on a Friday afternoon. They are not clowns or motivational speakers. However, teachers are far less happy to suggest their lessons shouldn’t be engaging. This is because engagement, as a weasel word, can have other meanings. You are engaged by something if it has your attention, or if it occupies you. No teacher will say “I won’t try to engage my students” because it can be understood to mean “I will neither get them to listen to me, nor give them anything to do”. If you claim that you do not engage your students you are saying they ignore you and do nothing. At this level, engagement is a truly meaningless aim because all learning involves engagement, but not all engagement involves learning. And here lies the problem, with some definitions engaging our students is something we all do, with other definitions it is something that reeks of dumbing-down and edu-tainment. On the one hand students are engaged by being kept awake and attentive; on the other hand they are engaged by being vaguely amused. On the one hand they are engaged when they are concentrating; on the other hand, they are engaged by not having to concentrate too hard. On the one hand they are engaged when they are being taught; on the other hand they are engaged when they are not being taught. We should probably lose this weasel word from the teacher’s vocabulary. If you mean entertain then say “entertain”. If you mean occupy then say “occupy”. But more importantly, we should watch out for when a lesson, a teacher, an activity or a resource is described as “engaging”. Our students are not automata; they don’t simply engage as an automated or automatic response to an engaging stimulus. They choose whether to engage or not. We shouldn’t ask whether a lesson was engaging, but whether students were choosing to engage, and hold those students responsible if they choose not to. You are currently browsing the Scenes From The Battleground blog archives for February, 2012.